We are currently living in a township called Katutura. In 1959, as part of South Africa’s apartheid policy, black Namibians were forcibly removed from Windhoek to townships around the city. Katutura (“the place where we cannot settle”) was the largest of these. Thankfully Namibia is now a Republic & apartheid ceased over a generation ago. 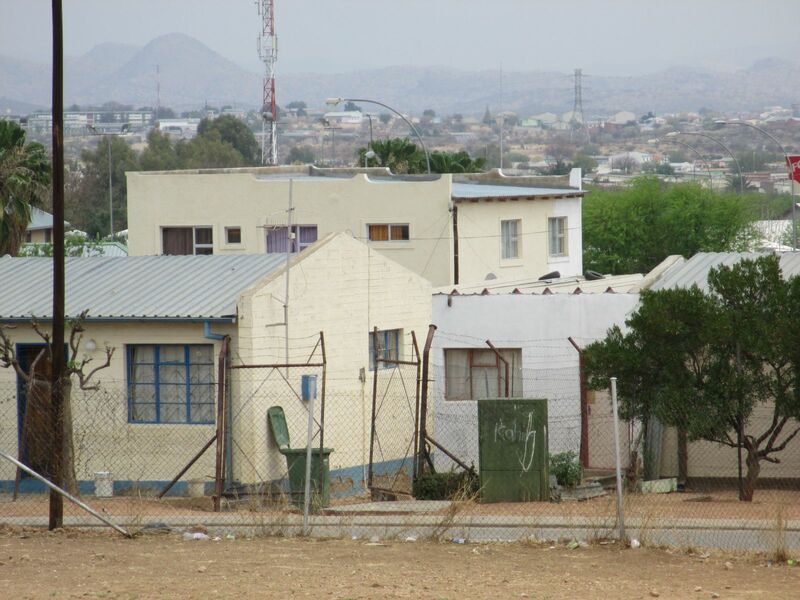 Modern day Katutura remains a black township, a sprawling suburb bigger than central Windhoek. Houses range from smart abodes to corrugated iron shacks. Many in the community live in very simple homes & poverty unfortunately remains a reality. The land itself is not conducive to gardening & lawn is non-existent. Homes are surrounded by bare earth & dogs bark in unison throughout the night. We are living with a local Namibian family who are graciously sharing their two-bedroom apartment with us for the next three months. We are being well looked after & enjoying the inter-cultural exchanges that occur each day. We have so much to learn about the local people & customs & at the same time they are leaning about Australia & our way of life. Our host’s eleven year old daughter was aghast to see Mike doing the washing up & advised that African men would never do that! Getting about the community we get the feeling they don’t see too many whites walking around these parts. We went food shopping last week & were the only white people in the shopping mall. Many of the more modern apartments have bars over each window & the front & back doors have large key locked security grills in front of them. Caution needs to be exercised & you don’t go outside after dark. Even some of our Namibian friends have been mugged at night time, so we listen carefully & adhere to advice. This morning we awoke to find a man going through our garbage bin outside the front door! Despite these challenges we are blessed to be living where we are & we are within walking distance of the EBC church. We are honoured to be living with a Namibian family & sharing daily life, laugh & meals with them. Boys in bare feet playing soccer in an area covered in stones (the ‘playground’). Girls with tightly plaited hair of all different lengths. Children fascinated by postcards showing pictures from Australia. Questions about nouns, adjectives, verbs and adverbs to answer. Singing songs about Jesus in unison with actions. Two white faces amongst many dark ones. On Monday we commenced our time at the After School Program run by volunteers from the Evangelical Bible Church. These are a great group of young people, most of whom are still studying themselves, who devote 3 – 4 hours each afternoon to help the kids in their neighbourhood. We proudly wear our red uniform T-shirts each day with them. We will be involved with the program for the next three months. How does it work? The program runs each Monday to Thursday afternoon from 2 – 5pm. (School here in Namibia starts at 7am and finishes at 1pm). The volunteers meet from 1:30pm to pray for the kids and the afternoon ahead. Friday afternoons are set aside for planning and preparation for the following week. The participants are aged between 7 to 17 and are divided into five different age groups. Around 80 to 100 kids attend each afternoon & gain help with their homework, along with learning life skills, obtaining reading assistance, playing sport / games & attending Bible Club. Why would the church be involved in this ministry? It is part of the overall HIV / AIDS prevention strategy as well as reaching out to the local community in a meaningful and needed way. By implanting positive messages and positive role models in these kid’s lives, constantly supported by the message of Jesus, the aim is to impact the next generation of Namibians to make the best choices for themselves and their nation. We were greatly encouraged when three kids gave their lives to Christ this afternoon following a testimony by one of the leaders. Monday was the first day back after a two week break. During the holidays one of the Grade 5 children had died in a car accident and a Grade 8 student was critically injured in the same crash. Within the last two months one of the leaders had also died quite suddenly although she had been unwell for some time. Sobering times for these kids. There was a message given about how precious life is, how uncertain life can be and how we must be prepared at all times to come before God. You never know who might turn up at the door to say hello. They say, “When in Rome, do what the Romans do”. When in Windhoek you catch a taxi. Taxis are the public transport here. Every third car or so is one. All of them have a number on the side and are generally older in appearance. A driver can take four passengers in their vehicle at any one time. The cost is a flat 9 Rand / Dollars (approx AUD $1.20) to most places in the city. How to catch one? Basically you stand at the side of the road and one will come by within about a minute. If they have room for more passengers they will honk their horn. Mind you, you only have to be walking down the street and you will have taxis honking at you constantly; you just keep on walking and not look up. Sometimes the taxi will pull over to the side of the road, but generally it just stops. You then indicate vaguely the direction you wish to go, the closest landmark near to your desired destination and how many people wish to go there and the driver will generally indicate that is fine. Do not expect to get driven to your landmark ( drivers do not go by streets or addresses ) immediately. Depending on who else is in the taxi at the time and who else the driver picks up on the way, your route can be quite a circuitous one. It is no point putting on a seatbelt when riding in the back of the taxi. There may not be one, or not enough, for a start. Also, as other passengers get out and new ones get in you have to keep sliding across the seat anyway. Driving seems to be done a lot via the horn; the streets are quite loud with the sound of them. You honk to indicate you have more room, you honk if the person in front of you is not driving fast enough, you honk if you are generally unhappy with the state of the road, you honk if its your turn to go across an intersection. We find ourselves holding my breath every time we come to a four-way intersection. The rule seems to be whichever car is at the intersection first, goes first; the second to arrive goes next and so forth. With a lot of taxi drivers in a hurry all the time there seems to be interesting interpretations of who actually got there first. We had our first near miss the other day. We are well and truly getting into the life that is Windhoek. We have been surprised by the level of security in Windhoek. Many houses are surrounded by high walls (complete with electric & razor wire) & big roller doors. All large shops in the CBD have security guards posted, as do ATM’s. On our first walk in the city, a young man ran past us at high speed following shortly thereafter by a security guard trying to keep up! We have learned to be cautious about personal security. We have been well looked after by local missionaries & it has been a real joy to meet them & their families. Two of the families arrived in Africa more than ten years ago & their initial postings were in rural villages with very basic conditions (read no electricity & running water). This was difficult to cope with especially with newborn babies in tow! A thought 3 years ago began a journey & that journey continues on Wednesday when we board a plane bound for Namibia! Where??? Namibia – South West Africa. We will spend three months based in the capital of Windhoek where we will serve the Evangelical Bible Church. People laugh when we tell them we have only been overseas once & that was to New Zealand 25 years ago (Ok go ahead). This might help to place in context the big step it is for us to get on a plane & travel half way around the world. It’s all a bit overwhelming & we feel out of our depth. It’s just as well God is in control & He looks to our availability & not our ability. Why would we choose to spend our long service leave serving as Associate Missionaries in a developing country rather than tripping around UK & Europe? Does it make sense? Is it foolishness? It’s a choice thing & it’s out choice! Under conviction of the Bible & under the power of the Holy Spirit, we choose to take God at His word & not conform to the pattern of this world. Uncertain where the next three months will take us but we step out in faith & trust God to do the leading. Will you join us? Read more about DESTINATION NAMIBIA!